The first hint for a cosmic-ray accelerator? Fig. 1: Blazars are a type of active galaxy with one of its jets pointing toward us. 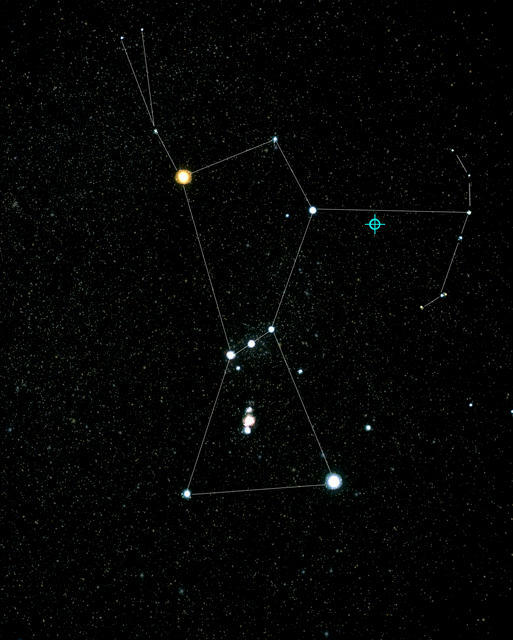 In the left-panel, the position of the blazar TXS 0506+056 is indicated, sitting just below the bow bearing arm of Orion. The right panel shows an image of the neutrino induced track event IceCube-170922A recorded by the IceCube detector in Antarctica, whose reconstructed position was found to be consistent with that of the candidate blazar source indicated on the left. The quest for the sources of cosmic rays (CRs), hadronic particles arriving at Earth with enormous energies surpassing those reachable by man-made colliders, has been ongoing for the past several decades. Although being ultra-relativistic, CRs are deflected by the magnetic fields that pervade the universe, which wash out the directional information about their origin. To date, no point-like excess in the distribution of CR arrival directions has been found so far. As a different attack on this problem, the relatively new research field of "multi-messenger astronomy" is now exploiting the fundamental particle interactions that provide unique links between various high-energy particles in order to gain fresh new insights into this problem. Combined observations of various cosmic messengers might indeed deliver the missing pieces of information about the violent phenomena connected to the origin of high-energy cosmic rays. High-energy gamma rays play an important role in this context. They are abundantly produced in most high-energy processes and provide a wealth of information on astrophysical sources, such as their location, morphology and energy spectra. Further significant information is brought about by high-energy neutrinos: their origin can be directly linked to the presence of high-energy hadronic particles. Although they provide a crucial piece of the puzzle in the quest for the sources of cosmic accelerators, neutrinos are inherently difficult to detect. Even in observatories like IceCube, which use an instrumented volume at the cubic kilometer scale (i.e. 1 km x 1 km x1 km in size!) 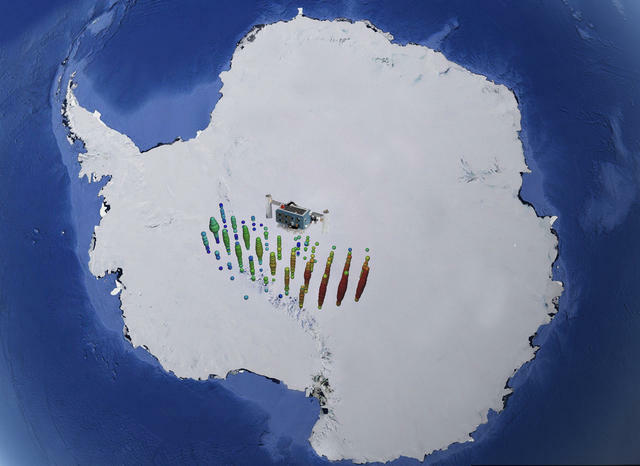 at the South Pole, only individual neutrino events have so far been identified. Reconstructed with limited accuracy, these events have not linked so far to astrophysical sources detected at other wavelengths. Over the last years it has therefore become clear that only a combination of various messengers, such as high-energy neutrinos and high-energy gamma rays, can bring together the required information to solve this long-sought problem. Combining the information from multiple messengers fully exploits the advantages of the individual observations and at the same time allows to lift degeneracies in the interpretation of the signals. For example, the observation of a spatial and temporal correlation between gamma rays and neutrinos would point towards a joint emission region (identified by the good spatial resolution provided by the gamma-ray observations) able to accelerate hadronic particles (causing the neutrino emission). The H.E.S.S. collaboration has been performing these searches for the past several years , in close collaboration with both of the major neutrino telescopes, IceCube and ANTARES. Within only a few tens of seconds, alert messages are exchanged between a worldwide network of instruments announcing the rare detection of high-energy neutrinos by these instruments. Thanks to a fully automatised treatment of these messages and the capability of the H.E.S.S. telescopes to react very rapidly, H.E.S.S. is often the fastest observatory in the network. This was again demonstrated on September 22, 2017: at 20:54:30.43 Coordinated Universal Time (UTC), a high-energy neutrino of about 290TeV (IceCube-170922A) was detected in an automated analysis that is part of IceCube's real-time alert system. An alert was distributed to observers 43 seconds later. The direction of the neutrino (reconstructed to an area of about 1 square degree and consistent with the location of a known gamma-ray blazar TXS 0506+056) became visible at the location of the H.E.S.S. observatory in Namibia around 4 hours later. An initial dataset of 1.3h was recorded during that night (cf. ). Additional observations were obtained on subsequent nights, but no gamma-ray emission could be detected from the region. Upper limits at 7.5 · 10-12 erg/cm2/s (95% CL) on the gamma-ray flux level were subsequently derived. Observations of lower energy gamma rays obtained with the LAT instrument onboard the Fermi satellite showed the blazar TXS 0506+056 to be in a flaring state since April 2017. Strong flux variations by almost an order of magnitude with respect to the long-term average had been observed over several weeks. As outlined above, the observation of a neutrino in spatial coincidence with the gamma-ray emitting blazar during an active phase (Fig. 2) suggests that blazars may indeed be a source of high-energy cosmic rays. This sparked the interest of the wider astronomical community and triggered an extensive multi-wavelength campaign with observations ranging from radio frequencies to high-energy gamma-rays. During this campaign, very-high-energy gamma rays with energies up to 400 GeV were detected by the MAGIC instrument located at the Roque de los Muchachos Observatory on the Canary Island of La Palma. The emission in X-rays showed clear evidence for spectral variability, the flux in the optical V band was the highest ever observed in recent years and polarization has been detected at the level of 7% in the R band. A summary of these observations, including the results by H.E.S.S., can be found in a joint publication . Finally, the redshift of TXS 0506+056 was recently determined to be z=0.3365&pm;0.0010 using the Gran Telescopio Canarias , providing crucial input into our understanding on the level of attenuation of the TeV flux following its propagation through extragalactic space (which is also pervaded by background radiation fields). Fig. 2: ASAS-SN optical V-band widefield image of the sky centred on the known position of the blazer TXS 0506+056. 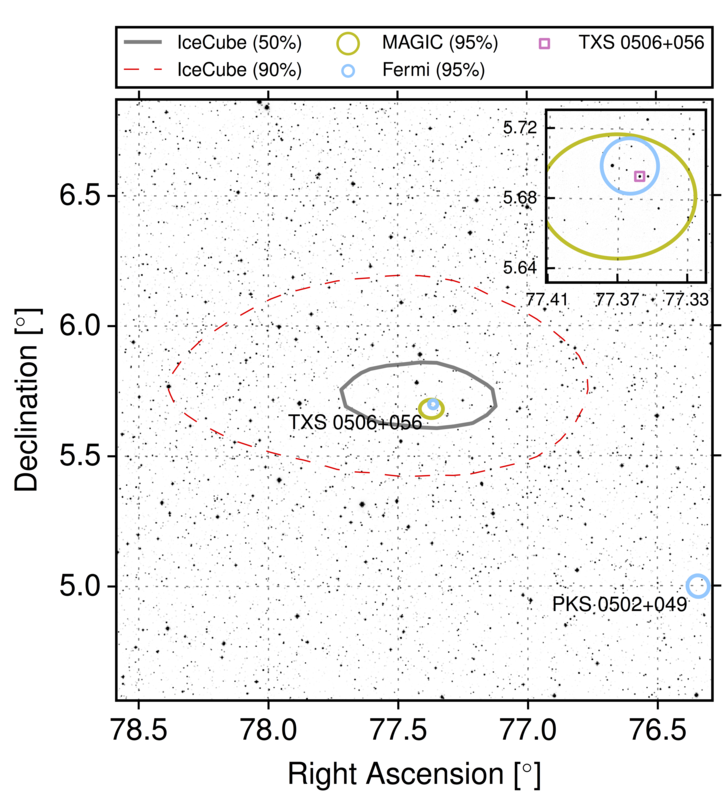 Two known objects from catalogues of gamma-ray sources generated Fermi Large Area Telescope are shown as blue circles, one being TXS 0506+056, with diameter representing the 95% position uncertainty. Also shown are the 50% and 90% containment areas (solid-grey and dashed-red contours, respectively) for the best-fit directional reconstruction of a high-energy neutrino detected on 22 September 2017 that indicate positional coincidence with the blazar. Subsequent very high-energy gamma-ray observations from the MAGIC imaging air Cherenkov telescopes also detected this source, with 68% positional uncertainties shown as the yellow circle. Inset is a zoomed view of the region of interest surrounding TXS 0506+056. From reference . As a caveat on all this excitement, it is important to keep a cool head, and note that there remains a 0.1% probability that the coincidence of the neutrino event with the flare of TXS 0506+056 is purely a random chance coincidence. It should also be noted that there is an additional 44% probability that the neutrino was induced by a CR hitting the Earth's atmosphere and would thus not be produced by any astrophysical object in the first place. In conclusion, the observed correlation between the high-energy neutrino IceCube-170922A and the flaring blazar TXS 0506+056 might indicate that gamma-ray blazars are indeed sources for at least a fraction of the observed astrophysical neutrinos, and may therefore be part of the sources producing high-energy cosmic rays. The window towards multi-messenger astrophysics with high-energy neutrinos and high-energy gamma rays may just have opened. These new possibilities will need to be verified and exploited by further future observations. H.E.S.S., as well as the next-generation instrument CTA, are prime instruments for doing this in the coming next years.